Learn the Design Thinking Process for Innovation Solutions | Free Training Quote! Turn your team into an innovation powerhouse. 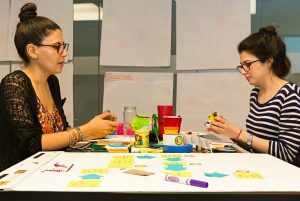 This fast-paced, highly interactive, and experiential half-day or full-day workshop puts groups through the paces of learning the design thinking process by doing. 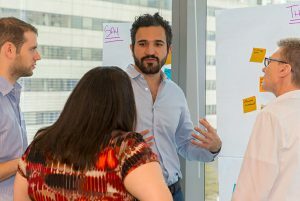 You will apply each phase of the process (Empathize, Define, Ideate, Prototype, Test) to a specific challenge and get exposure to and experience with using tools such as 1-on-1 empathy interviewing, customer personas, and empathy maps, and apply rapid prototyping techniques that result in an actual solution to the given challenge. This half-day, full-day, or multi-day training turns Design Thinking: 101 in to an actual working session for your team. You’ll be put through the paces once again, but this time will apply the methods and tools toward an actual, real-world workplace challenge your team faces. We’ll even help get your actual customers/end users in the room so you can gather authentic insights that will result in true progress. 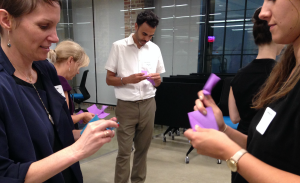 This half-day group training uses methods from improvisational comedy to reinforce the skills needed to be effective design thinking practitioners. Through a series of interactive, experiential exercises, participants will hone their human-centered skills related to empathy, problem solving, ideation, prototyping, and solution testing. Great for design thinkers at any level – from beginners who are curious to experts who want to enhance their craft. Looking for a different type of design thinking workshop? We also do customized sessions! Interested in a Design Thinking Workshop?